This dessert was one of the very first recipes I posted on my blog. It has since become a holiday favorite for many families! I have updated this post and republished it with new pictures and more detailed recipe instructions. Enjoy! Summer is coming to an end, which means goodbye sunshine, hello holidays! From September through the end of the year, we celebrate some amazing food-filled Jewish holidays. The first is Rosh Hashanah, the celebration of the Jewish New Year signifying the end of the Hebrew calendar cycle. It is the first of what we call the High Holidays (or High Holy Days), a ten-day period that ends with Yom Kippur—the holiest day of the Jewish year. Rosh Hashanah occurs on the first and second days of Tishri, which is the seventh month on the Hebrew calendar. On the Roman calendar, Rosh Hashanah usually occurs during the month of September. Jews from different parts of the world celebrate Rosh Hashanah in a variety of ways. Holiday traditions vary according to family background and local customs. A special prayer service is held at synagogue emphasizing both repentance and remembrance. During this service, gratitude is expressed to God for the creation of the world and humanity. 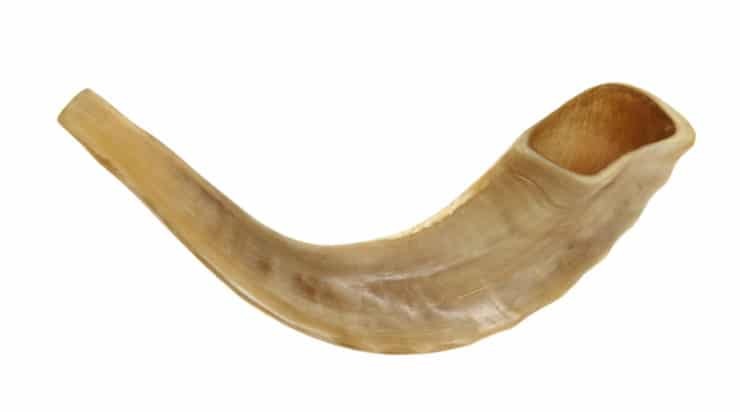 The shofar, a special instrument made from the horn of a kosher animal (usually a ram), is blown. Tzedakah, or charitable giving, is also part of the holiday. Good deeds are done in the hopes that God will seal our names in the “Book of Life,” which brings the promise of a happy year to come. And then, of course, there’s the food. What would a Jewish holiday be without a celebratory meal of epic proportions? (Unless of course it’s Yom Kippur, a fasting holiday.) The Rosh Hashanah meal—or meals, depending on the way you celebrate—are particularly fun, because they feature symbolic foods that signify our hope for a “sweet new year.” We enjoy “new fruit,” a fruit that has recently come into season but we have not yet had the opportunity to enjoy this year (often a pomegranate). The head of a fish is sometimes served, symbolizing the literal translation of Rosh Hashanah, which means “Head of the Year” in Hebrew (on our table it’s strictly symbolic, we don’t eat it). Challah is baked fresh, sweetened with raisins or fruit and braided into a round shape. Apples and challah are dipped in honey, again symbolizing sweetness. In fact, honey is a major ingredient in many traditional Rosh Hashanah dishes, including the famous (or should I say infamous!) 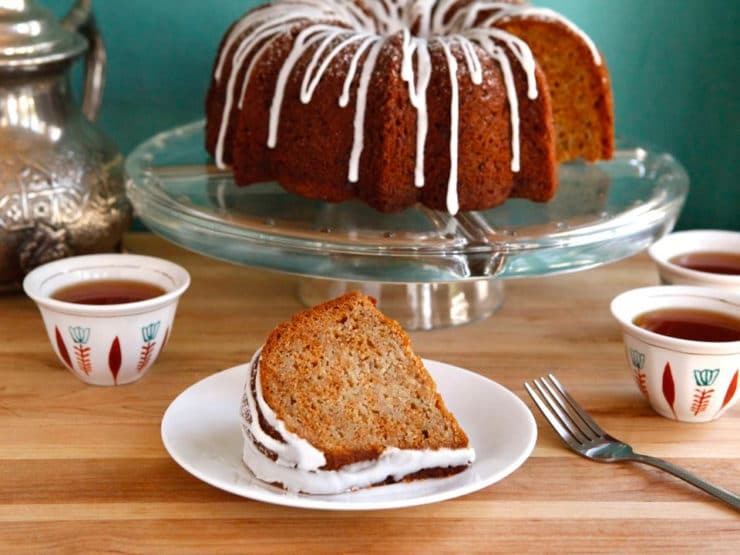 Rosh Hashanah honey cake. 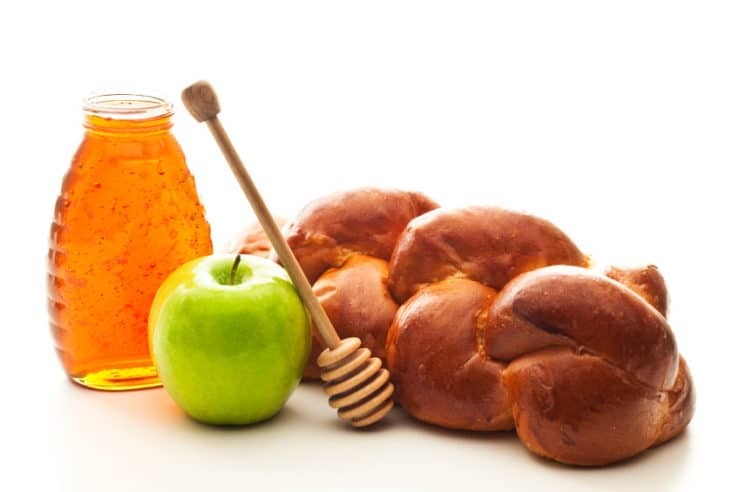 Honey, apples and challah are traditional Rosh Hashanah foods. I had trouble getting excited about this whole honey cake tradition. At my first few Rosh Hashanah celebrations, the honey cake was my least favorite part of the meal. It’s usually a dry, overly-spiced, overly-sweet cake that sits virtually untouched on the Rosh Hashanah buffet—more like an afterthought than a truly inspiring dessert. I tried many traditional honey cake recipes over the years, but each one seemed more disappointing than the last. I experimented with my own recipe ideas, but it always turned out kind of…well, honestly, kind of blah tasting. A few years ago, as we were dipping our apples into honey, it occurred to me that maybe I’d been approaching this whole honey cake thing from the wrong perspective. Yes, a honey cake is traditional—but apples are also a traditional Rosh Hashanah food. Why not combine the two flavors into one dessert cake? Around that same time I bought my first Bundt cake pan, so I decided to play around with it and see what I could come up with. After a few failed attempts, I discovered the right combination of ingredients and baked an irresistible Honey Apple Cake. Shredding apples into the batter lends moisture and creates a lovely texture. This recipe is now our Rosh Hashanah tradition. My family enjoys it so much that I often serve it for other cold weather holidays like Sukkot, Thanksgiving and Purim. I’m so excited to share it with you! 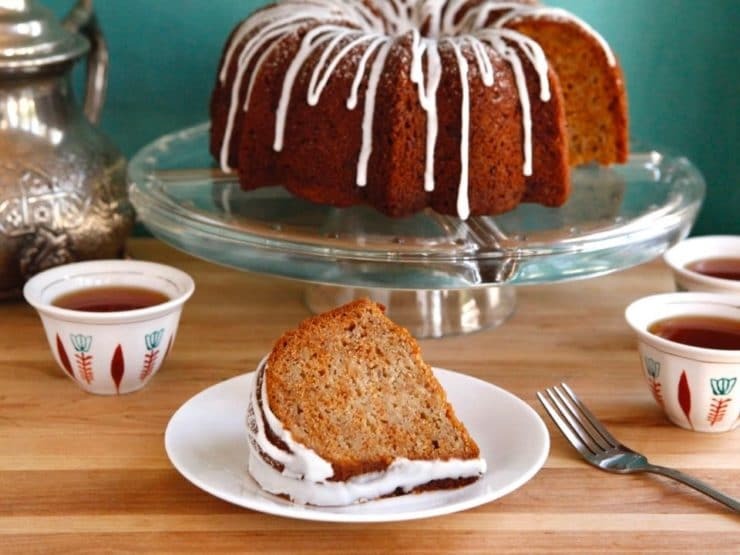 This Honey Apple Bundt Cake for Rosh Hashanah is moist, sweet, and beautifully iced for a unique twist on Jewish honey cake. Kosher, Pareve. 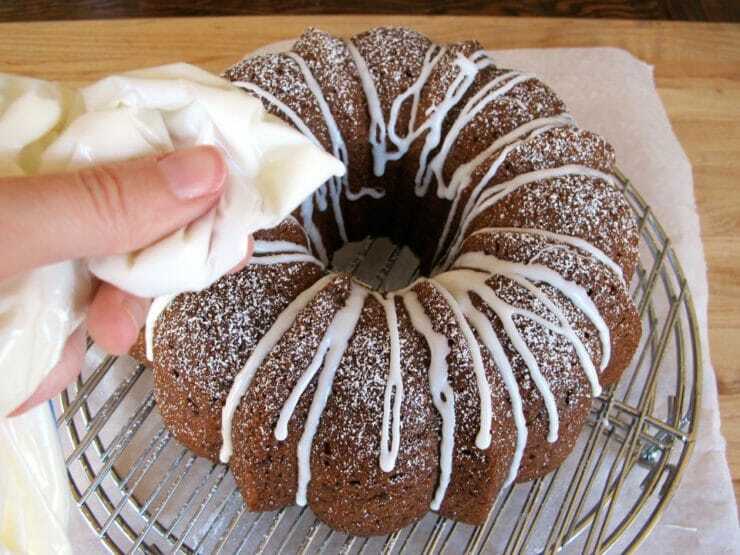 Spray your Bundt pan with cooking spray, making sure to evenly coat the entire inner surface. Pour your batter into the pan. 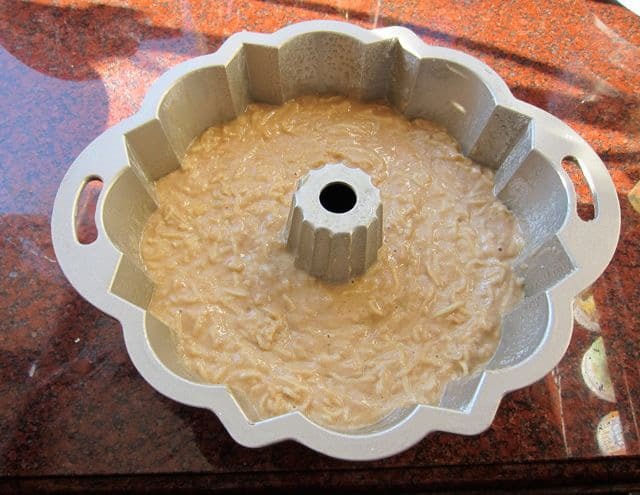 Bundt pan depths vary, so make sure the batter fills the pan ¾ full or less. 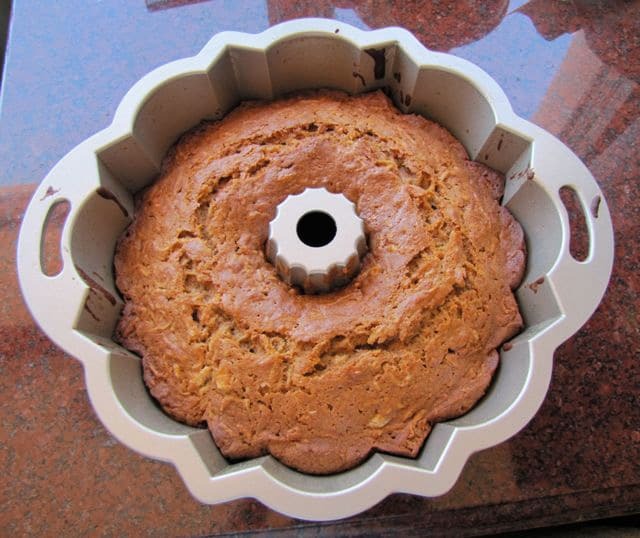 Do not fill beyond ¾ or your cake might overflow during baking. 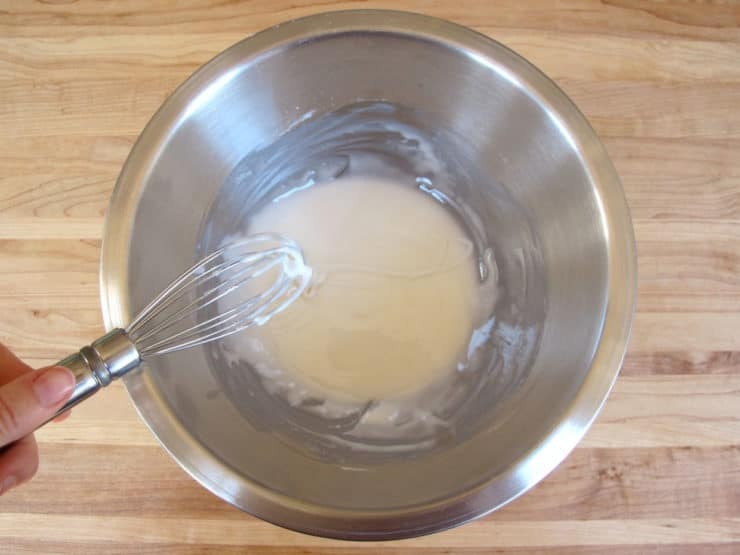 Use a spatula to gently push the batter to the outside of the pan, pushing slightly up the walls. This will help to get rid of any air pockets that might interfere with the pretty details of the pan. Smooth the batter on the top so it is flat and even all the way around the pan. Bake cake in preheated oven for 75-90 minutes. When the edges darken and pull fully away from the sides of the pan, and the cake browns all the way across the surface, insert a toothpick deep into the thickest part of the cake. If it comes out clean, it's done. It’s a very moist cake, so it’s easy to undercook it– err on the side of caution and let it bake a little longer if you’re unsure (but don't bake it too long or it will dry out!). Let the cake cool for exactly 10 minutes, then invert it onto a flat plate. 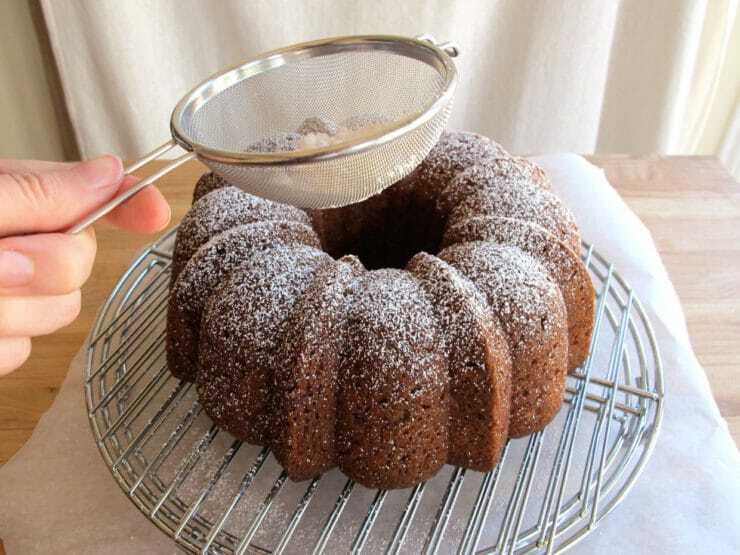 Tap the Bundt pan gently to release the cake. 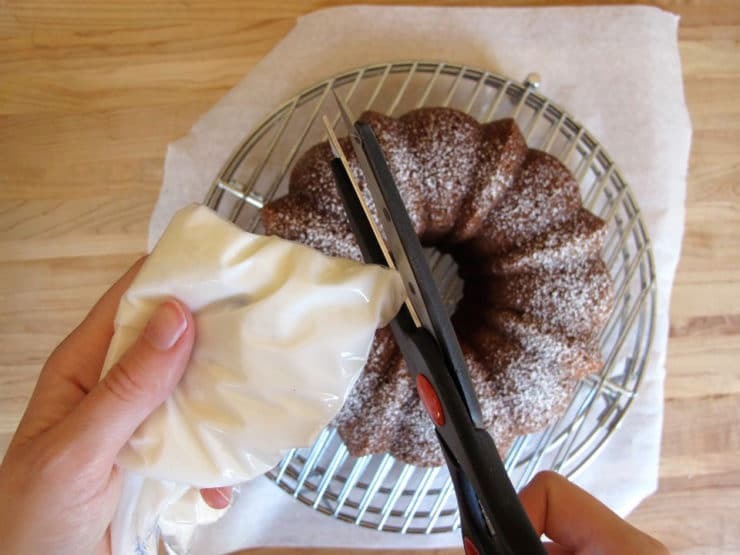 If your cake sticks, use a plastic knife to carefully loosen the cake around the center tube and sides. Allow cake to cool completely (very important to let it cool before frosting). Now it’s time to decorate your cake. 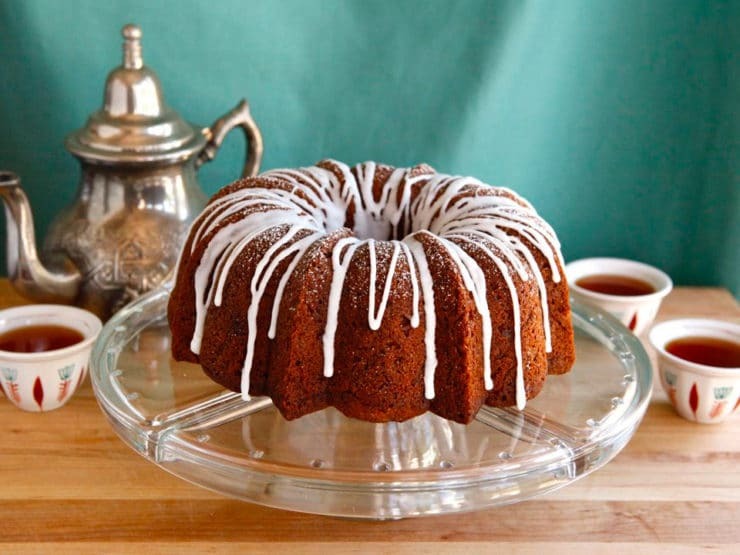 Decorate this cake the same day you serve it; the cake is moist so it tends to “soak up” the powdered sugar, plus the icing looks prettier fresh. To keep things neat, I like to do this part on a wire cooling rack with a piece of parchment paper underneath to catch extra sugar/ drips. You can simply do it on a plate if you prefer. 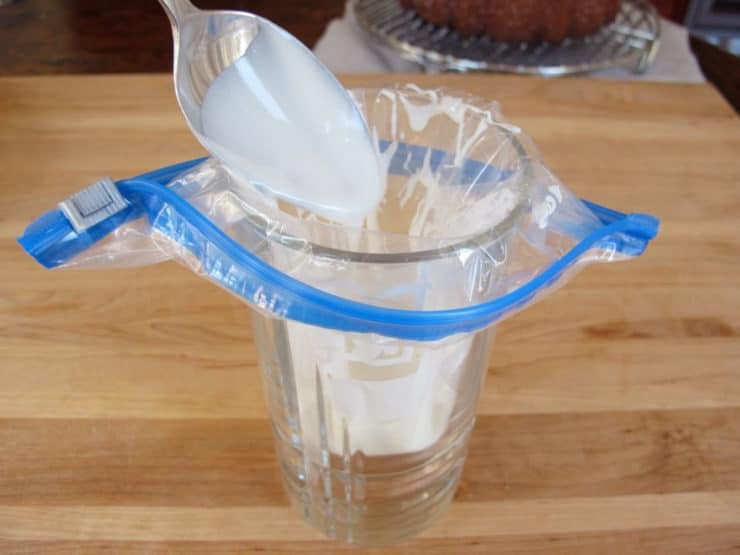 First, put 3 tbsp of powdered sugar into a handheld mesh strainer or sifter. Sprinkle sugar onto the top of the cake by tapping the strainer or sifting to release an even shower of sugar around the surface of the cake. Next, make your drizzle icing. Sift 1 cup of powdered sugar into a mixing bowl. Add ¼ tsp of vanilla extract and 1 tbsp non-dairy creamer to the bowl. Stir with a whisk or fork to blend. Add additional non-dairy creamer by teaspoonfuls, mixing constantly, until the mixture has the texture of very thick honey. You want the icing to be quite thick, but still pourable. When you can drizzle the icing in stripes across the surface, and it takes a few seconds for those drizzles to dissolve back into the icing, the texture is right. Place a Ziploc bag inside a tall water glass, open end facing upward and wrapped around the edge of the glass, so there is an open space for easy filling. Pour the icing into the Ziploc bag. Close the bag, leaving a small bit open to vent. Guide the icing towards one of the lower corners of the bag. Cut the very tip of that corner off the bag. Drizzle the icing in a zig-zag pattern around the cake by squeezing the Ziploc bag gently to release the glaze. Allow icing to dry completely before serving—this usually takes about 30-60 minutes. Slice and enjoy! One of the BEST honey apple cakes I’ve ever had. I’m thrilled that I found you. I am not Jewish but a good friend is. Would this be appropriate to give the day before yom kippur? I wanted to do something for rosh Hashanah but wasn’t able to. This turned out delicious. I made this for the first time for a Rosh Hashanah dinner party. I am always nervous trying a new recipe without trying it before serving it but luckily this recipe has been tailored perfectly. It is moist, not too sweet, and has tons of flavor. The only changes I made were using vegetable oil instead of canola oil and I added some fresh lemon juice to the frosting since I found it a little too sweet. Thank you for this recipe! I followed these instructions faithfully, but by 30 minutes at 325 degrees F, my cake was already overdone. The cake’s flavor was nice, but it was very, very dry. I’m surprised that the recipe calls for 75-90 degrees. Hi Jonathan– how strange. I can’t help wondering if you missed a step in the making of the cake. This cake is very moist and requires a long bake time. As you can see from comments, many have made it as written with great results. Perhaps you left out an ingredient, like the oil? At any rate, I’m sorry it didn’t work out for you! Thank you. I have made the Joy of Kosher version for 2 years running and even with reducing the white sugar I can’t really taste much of the apple. I am going to try this recipe next. Beautiful and delicious cake! Just made it and it’s a definite keeper for years to come. I am so excited that it’s Rosh hoshana again!! This is my favorite cake for the holidays!! Not sure what you mean by non-dairy creamer? What do you use? A creamer added to coffee or tea that is made without dairy products. Alternatively you can use water. Just be sure to follow the instructions carefully, the key is not adding too much liquid to keep the icing opaque. I am going to attempt to bake a cake for the first time, and I am only 13. I am hoping that this will be a great thing to bring to a Rosh Hashana party I have been invited to for years with my family. I am also making a honey buttercream to go with it, do you think they will go together, or is the honey already very prominent in the cake? Hi Sasha. 🙂 Do you mean a honey buttercream frosting? The cake has a distinct honey flavor. You can certainly add the frosting, but the cake is already quite moist so doesn’t really need one. I use the Star of David pan every year and it holds all the batter and comes out beautiful! I have some pictures of it I could post, but don’t know how here. Love this recipe! It’s my go to for Rosh Hashannah every year! Also, the pan is very full. As it bakes it looks like it will spill over as it rises, but I have never had that happen. This is the third year I am making this cake. It is now demanded by both my family and my kids’ teachers (in cupcake form for school) and it’s absolutely delicious! Love all of Tori’s recipes. Thanks! Oh my! I just finished making the Honey apple cake. I had some batter left over so I filled a small ramekin and baked that off as the larger cake was cooking. My husband and I have made significant inroads into our little “taste-test” cake and it is outstanding. As soon as the large cake cools I will wrap it and freeze it lest we are tempted to plow into it before Rosh Hashanah dinner. I make this every year as muffins. Delicious and so easy to make plus they freeze really well. Thanks Tori! 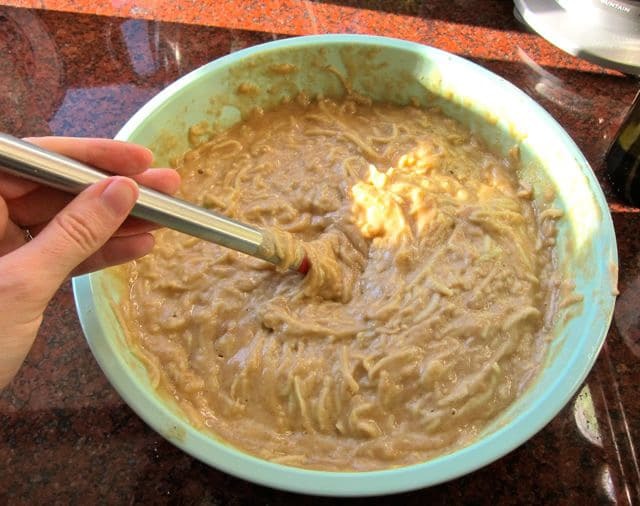 I’m very much looking forward to making your honey apple cake for Rosh Hashanah. But I am uncertain about the volume of apple to incorporate. The Granny Smith apples in my market are huuuuge! I’m afraid that four shredded apples may be too much for the recipe (on the other hand, I don’t want to make a mistake by adding too little). Any thoughts / guidelines on how much is enough? Hi Deborah! I should measure the shreds next time I make this, thank you for pointing that out. Overall it’s a very forgiving cake so I wouldn’t worry too much about the size. If they are really quite large, you might just shred 3 1/2 apples to be safe. Good luck! Thanks Tori! Shana tova to you and your loved ones. Hi! I really like this recipe and I was thinking of adding chopped walnuts to the batter for some extra texture and flavor. Do you have a suggestion for how much chopped walnut I should add? Thanks! I’ve been tasked with finding a good apple honey cake for my synagogue. I’ve had wonderful results with Tori’s other recipes and this one seems to fit the bill! However, I’d like to make these as mini-muffins as opposed to a Bundt cake. Do you think there would be any issues with that? Not at all. In this post, my contributor Brenda made regular cupcakes with great results: https://toriavey.com/toris-kitchen/family-fun-rosh-hashanah-honey-apple-cupcakes/ Mini cupcakes will of course have a much shorter bake time, but as long as you keep an eye on them and test for doneness you should have great results. Wonderful idea with honey, apple, and cake. Will try it soon. I had to cut back the bake time to 45 minutes. It was done by then. I served this cake to my book club members. What a great hit. Everyone wants the recipe now. Thanks! I prefer a sweeter apple than Granny Smith, and no powdered sugar, and I was hoping to reduce sugar in entire recipe. Do you have any advice? Hi Bonnie, you can cut the powdered sugar glaze it is optional. Feel free to use another apple other than Granny Smith. I wouldn’t cut the sugar to less than 1/2 cup- 3/4 is ideal, 1/2 cup will probably be fine but it won’t be nearly as sweet. Keep in mind it’s a large cake. Good luck! Hi Sam, Tori’s assistant Ashley here. Yes, you can freeze this. Can I substitute a 1/4 cup of the oil and use 1/4 cup of whiskey? Amazing cake! I make it for my family every year and they love it! Note that as the instructions say it’s very easy to under-bake it so be careful! This cake was delicious. Any suggestions on how to cut down on the oil? Hi Sara, Tori’s assistant Ashley here. 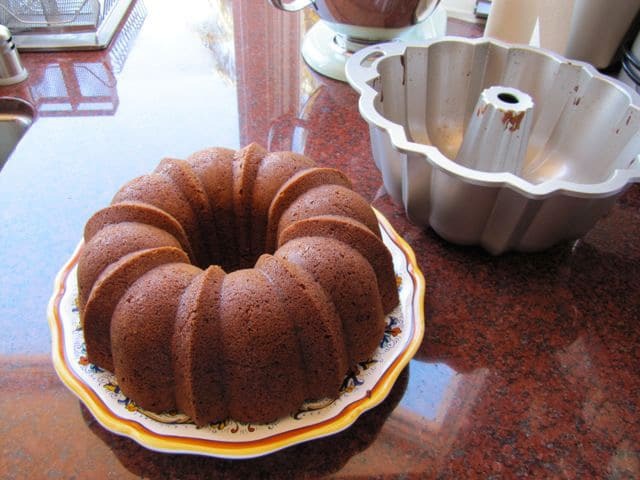 Using non-dairy creamer makes this cake Pareve so that it can be served with a meal that includes meat. Hi, I used gluten free flour as my son is allergic. It came out dry. Any suggestions? Hi Soo, Tori’s assistant Ashley here. We haven’t made a GF version of this cake and, unfortunately, substituting gluten free flour in place of regular flour often gives a dry result. Perhaps another reader has made this gluten free with success? 2 possible culprits: using only whole grain flours with no starch, or measuring by volume instead of weight. I made this gluten free, and it was wonderful! I used a total of 390 grams, with a combination of cassava, millet, sorghum, potato starch, and tapioca starch. I also replaced the canola oil with avocado and coconut oil, so the different fat profile could have changed (helped?) the texture. Overall, it tasted and felt like an apple cider donut. We loved it! Hi, Tori. Thanks so much for this recipe! I just made it this past Rosh Hashana and everyone loved it! The only issue I had was that the shredded apples seemed to have separated from the rest of the cake and rose to the top as the cake baked. I grated the apples straight into the batter and mixed well, so I’m not sure why the cake was not uniform. What can I do to prevent this from happening next time? That is really strange! It has never happened to me before. Generally if I don’t want ingredient separation with harder ingredients (ex. chocolate chips) I toss them in the dry ingredients first before incorporating into the wet batter. But here, the apples are moist and it would just get gunky if you tried that. I’m not sure what to say. Did you make the batter ahead and let it sit in the fridge? If you mixed the batter and baked it right away, I’m stumped. Luba it is one and one-quarter cup of oil.